The Sensory Garden Playground is open to the public daily, from dawn until dusk. Accessible, portable washrooms are available onsite for your convenience. Hotels and dining options listed below are less than 5 miles from the Sensory Garden Playground. For additional lodging and dining options in the area, please visit Lisle Convention and Visitor’s Bureau. Interested in renting the Sensory Garden Playground for your next party or event? At the present time, we are not allowing exclusive rentals of the site. If you would like to bring a small group or party to the site, you are welcome to do so, but please know that the site will remain open to other visitors. If you decide to hold a small group or party, we invite you to make a donation on the Sensory Garden Playground Donation page at kindful.com as all donations help us to continue to build future phases of the project. If you have specific questions, please contact Margie Wilhelmi, Director of Marketing, at mwilhelmi@wheatonparks.org, or call 630-510-4984. 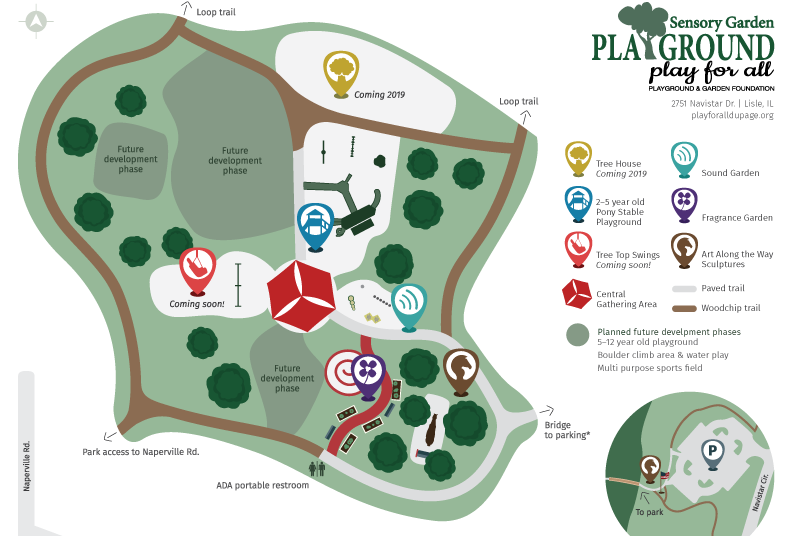 To learn more about how you or a business you know can support Play for All, please contact sensoryplay@wheatonparks.org.